Three outstanding jurists were honored November 12 at the 2014 Judicial Excellence Awards, hosted by the Colorado Judicial Institute (CJI). An audience of over 600 jurists, attorneys and business and community leaders were on hand at the Denver Marriott City Center for the annual Judicial Excellence for Colorado Dinner. Among the guests were Colorado Chief Justice Nancy Rice and retired Chief Justice Michael Bender; Colorado Supreme Court Justices Monica Marquez and Brian Boatright; and twenty current or retired Colorado Court of Appeals judges. In total there were over seventy current or retired State and Federal judicial officers. This year’s honorees were District Court Chief Judge Claude W. Appel of the 3rd Judicial District, County Court Judge Sabino E. Romano of the 17th Judicial District and Magistrate Marianne M. Tims of the1st Judicial District. Chief Judge Claude Appel was appointed as a District Judge in March 1986 after serving as a County Judge. Prior to his appointment as a judge, he was in private practice in Longmont, then served as a Deputy District Attorney in the Third Judicial District in southern Colorado. Judge Appel started the Huerfano County Teen Court program in 1995, operating out of both District and County Courts and in two local high schools for 16 years. Currently, he presides over two alternative drug courts in both Huerfano and Las Animas counties. These programs are examples of how Judge Appel has positively affected his district both inside and outside the courtroom. Judge Sabino Romano, was appointed County Court Magistrate in Arapahoe County in 1983, after being in private practice. In 1986 Judge Romano was appointed as an Adams County Judge by Governor Richard Lamm and has served in that position for 28 years. Judge Romano, known as one of the friendliest judges in the 17th Judicial District, has handled the full scope of County Court cases. He handles civil cases exclusively. 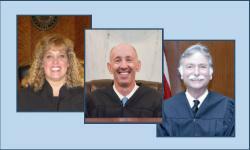 Judge Romano processes approximately 31,000 cases and presides over 400 trials per year. Magistrate Marianne Tims is the 1st Judicial District’s Chief Magistrate and has received much acclaim for her work protecting children and trying to resolve family issues, a specialty that she proudly embraces as her life’s work. Prior to her 2004 swearing in in Jefferson County, Magistrate Tims had been a county attorney in both Jefferson and Arapahoe counties handling child protection cases. As Chief Magistrate she administers six other magistrates and staff. In addition to overseeing the magistrate divisions, she also coordinates with the district court divisions who hear the juvenile and domestic cases coming out of the magistrate divisions. The Judicial Excellence Awards formally recognize judicial excellence in Colorado and the annual event raises money in support of CJI’s Judicial Education Fund, which has provided $330,000 for Colorado Judicial Education since 2005. Keynote speaker, Hugh Caperton, congratulated the honorees and praised Colorado’s merit system of selecting and retaining judges, as opposed to the big money financing of judicial elections by special interests that occurs in some other states. “Colorado’s merit selection system is the best way to ensure that justice doesn’t have a price tag,” Caperton noted. The keynote speaker decried the increasing influence of money in judicial elections around the nation. “Special interest groups are starting to realize it’s easier to spend money on one judge than several legislators,” he added. Caperton was at the center of the U.S. Supreme Court’s Landmark Case: Caperton v. A.T. Massey Coal Company, Inc., a legal saga that is the basis for the John Grisham book, The Appeal. In 1998, a West Virginia jury ruled that Massey Energy had driven Caperton’s small coal company into bankruptcy. Caperton and his company were awarded $50 million by a jury. While waiting on the appeal, Massey CEO Don Blankenship contributed $3 million to the West Virginia Supreme Court election campaign of Brent D. Benjamin. The amount represented 60 percent of Benjamin’s total spending in the successful campaign. Despite the campaign contribution and photos of Benjamin and Blankenship vacationing in France that surfaced during the trial, Benjamin refused to recuse himself from the case and cast the deciding vote overturning the jury decision against Massey, not once but twice. In a 5 to 4 decision, the Supreme Court ruled in 2009 that it was unconstitutional for a state Supreme Court justice to hear a case involving the financial interests of a major supporter of a justice's election campaign. Today, with the verdict of the original jury ruling at $75 million when interest is taken into account, the case is still being bounced through the court system. Caperton’s message is that high profile cases like Caperton vs. Massey have changed public perception of how big money influences courts.